I wonder at how many of us, feeling unsafe and unprotected, either end up running far away from everything we know and love, or staying and simply going mad. I have decided today that neither option is more noble than the other. They are merely different ways of coping, and we each must cope as best as we can. You see, Asha, I must rationalize your leaving and her staying—and, as many see it—going mad. Otherwise I must admit to feelings of anger that you left your sister behind. While I don’t begrudge your leaving, I wonder if you ever tried to encourage her to go with you. Asha, from the way she calls your name, it is clear that she, more importantly than I, does not begrudge you. Cereus Blooms at Night is a novel set in a fictional Caribbean island by the name of Lantanacamara. The story opens when Nurse Tyler arrives in Paradise, the island’s major town, to work at the local Alms House. The Alms House has just received a new patient – a mostly silent, mysterious elderly lady by the name of Mala Ramchandin. Tyler, the narrator of the novel, hints at some taboo surrounding Miss Ramchandin, some rumours that cause the rest of the staff to refuse to go near her. As a result, he ends up becoming her sole caretaker. As the novel progresses, we learn about the Ramchandin family’s past through a series of flashbacks, and slowly uncover a story where the damage caused by homophobia, misogyny, racism, and the way these different forms of oppression interact has left scars that go back for generations. 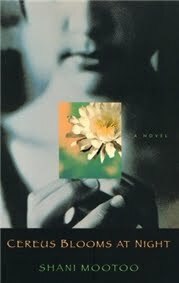 In addition to being Mala Ramchandin’s story, Cereus Blooms at Night is also about Tyler himself: the reader quickly learns that although he identifies as male and is referred to by male pronouns throughout the novel, Tyler is genderqueer and has never really found a place where he felt that be belonged. Cereus Blooms at Night has a large cast of glbtq characters, and one of my favourite things about it is that even though it’s a very painful book, it’s not by any means a book solely focused on dysfunction. There are scenes of horrifying violence, particularly sexual violence, but the characters nevertheless experience joy, discover love, and find strength in their identities rather than despite them. For example, the quiet Miss Ramchandin soon reveals to Tyler that she delights in seeing him dressed in a female nurse uniform. Her reaction to his cross-dressing is moving not only because it constitutes a form of acceptance that Tyler is not at all used to, but also because it’s so spontaneously celebratory: she looks at Tyler and sees not someone in need of comfort or reassurance, but someone who is beautiful exactly because he falls outside the gender binary. Another thing that makes Cereus Blooms at Night stand out is Shani Mootoo’s writing: her prose is lush, rich in imagery, filled with a huge sensorial pull, and perfect at bringing her setting to life. The novel is filled with descriptions of the smells, sights and sounds of Lantanacamara, as well as of the flowers and insects that constitute some of Mootoo’s central imagery. Her writing is also infused with a mysterious Caribbean Gothic atmosphere that immediately draws the reader in. There was much about this novel that reminded me of Faulkner’s “A Rose for Emily”: both have a nonlinear structure, a reclusive old lady at their centre, a house no one has entered in decades, a small town ablaze with rumours, a past tragedy, and family secrets. However, Mala Ramchandin’s story has very different implications, particularly in terms of gender politics. As I said above, there are graphic (though not exploitative or gratuitous) scenes of sexual violence in Cereus Blooms at Night, but these are intermingled with moments of real beauty, of human connection, of survival against all odds – much like the cereus flower that gives the novel its title. The story ends on a note of hope: the past cannot be erased, but it’s not too late for these characters – not for the young Tyler, and not even for the elderly Miss Ramchandin. As the public scene of tenderness between Tyler and Otoh at the end of the novel demonstrates, these characters can carve out spaces where they’re allowed to be who they are and to connect to others freely, despite social censure and the narrowness of enforced gender roles. Great review, was great to hear your thoughts on this one. You are right, definitely great beauty as well as the violence. This one sounds really beautiful and like something I'd really enjoy. I'm peeved to discover my library has no copies. Grr. They have a different book by the same author, so I might try that one once I'm back from vacation, or try to ILL this one. This sounds like a book I would really enjoy. Searching it out on Goodreads right now! Not sure how I would cope with the graphic sexual scenes but love the sound of Carribean gothic. I just ordered this one from the library, after reading half of your review, then I headed back over here to read the rest. This sounds like an amazing book, and one that is really important. I am not really all that bothered by the graphic nature of some of the scenes, but it's the things in between that have caught my interest. fantastic review today, Ana! This sounds like a really different sort of book, but one I might wait awhile to read, I feel like I've had my fill of sexual violence for awhile, even if said violence serves the story. Thanks for another thoughtful review, Ana! This sounds very interesting - I think it would give me a lot to think about. This one sounds wonderful in about a million different ways! Really, really want to get my hands on it. And you know, actually get around to reading when I do. You really hit the nail on the head there. One thing that was brought up by my prof when we were reading this in class is that Nurse Tyler and Otoh have a perfectly functional and romantic relationship which is something you don't see a lot of when it comes to gender-queer characters. This sounds beautiful, with all the upward-reaching delicacy the word implies. I'll have to take a look. Amy: Thanks for reminding me I needed to read it! Amanda: I hope you manage to ILL it! In the meantime, I look forward to your thoughts on her other book. Rayna: Thank you! Hope you enjoy it as much as I did! Vivienne: I coped with them okay, but of course I know milleage varies from reader to reader. The best thing I can say is that it's easy to see those few pages coming. Zibilee: I can't wait to hear what you think! Amy: I definitely understand. When you feel like you're up for it, though, it's a hugely rewarding book. Kathy: It certainly did me! Michelle: Such a good point about Tyler and Otoh. I loved the scene with the two of them - so sweet. Clare: I'd love to hear your thoughts on it! Iris: As I was telling Vivienne, that part is easy to see coming, so if you don't feel up to it you could skim ahead. I love the idea of this book but do worry how I'd cope with the sexual violence. I recently read Stuart: A Life Backwards which contained references to child abuse I managed to read it and it was such a rewarding read. So I wouldn't write this book off but I do know I would need to be in the right frame of mind. Thank you for sharing such a different type of read. Jessica: I found this novel very worthwhile too, but I completely understand the need to be in the right frame of mind. Wow, what a powerful quote. If the entire book is written like this, I just may need to read it. Thanks for sharing!